The Zoo does not have lockers available. Guests are welcome to bring their own bags, coolers and wagons to carry around the Zoo. No glass containers or alcohol are allowed. Can we bring outside food and beverages? Coolers and bags? The Zoo allows outside food and beverages on grounds. These items can be brought with you inside of a bag or cooler. Glass containters and alcohol are not allowed. Moms may nurse their children in any public location at the Zoo. According to Nebraska law: "In Nebraska, women may breastfeed their children in any public or private locaton where the mother is otherwise authorized to go." A Baby Care Center, located within Children's Adventure Trails near the North Entrance of the Zoo, has two private nursing rooms. Other private areas include the family restrooms at the Zoo's main entrance, Expedition Madagascar, the Sea Lion Pavilion, Wildlife Management Headquarters at the Lion Viewing Area of the African Grasslands and the African Lodge. Each of these areas offer a private restroom, chair and changing table. Do you have strollers or wagons available for rent? Strollers and wagons are available to rent on a first come, first serve basis. A single stroller is $9 for the day. Double strollers or wagons are $13 for the day. They are available at the Main Gift Shop year round or at the Zoo's North Entrance Memorial Day to Labor Day. Guests are also welcome to bring their own strollers or wagons from home. Are motorized wheelchairs available for rent? Electric shop riders are available for $28 each per day. Manual wheelchairs and adult chairs are $9 each per day. Both are available at the Main Gift Shop, located near the main entrance of the Zoo, year round. Rentals are available on a first-come-first-serve basis. Guests are also welcome to bring their own motorized or manual wheelchairs or take advantage of our train, tram or Skyfari. Click here to view operating hours. An ATM is located inside of the Zoo's Main Gift Shop near the main entrance of the Zoo. The ATM is serviced by First National Bank of Omaha. Can we smoke at the Zoo? The Zoo is a smoke and tobacco-free facility. Are there any hotels in the area? Which one is the closest? For hotel and lodging information, please check out Visit Omaha by clicking here. Are concealed firearms allowed at the Zoo? Concealed firearms are not permitted on Zoo grounds. Are pets allowed at the Zoo? Pets are not allowed on Zoo grounds. However, a limited number of kennels are available for pets on a first come, first serve basis inside Guest Services, located at the main entrance of the Zoo. Contact our Guest Services Department at (402) 733-8401 for more information. Does the Zoo provide a kennel service for traveling pets? We encourage that your pets not be left inside of your vehicle during your Zoo visit. For your convenience, a limited number of kennels are available for pets on a first come, first serve basis inside Guest Services, located at the main entrance of the Zoo. Do we charge for parking? Parking is free and available on a first come, first serve basis. Are there any exhibits closed throughout the day? There are times when certain animals will be off display or an exhibit may be closed. Please contact our Guest Services Department at (402) 733-8401 to learn of any closures before your visit. Omaha's Henry Doorly Zoo and Aquarium and Wildlife Safari Park no longer accept personal checks with the exception of the purchase of Omaha's Henry Doorly Zoo and Aquarium memberships. The only forms of payment accepted are Travelers checks, Cashier checks, Money orders, Business/Company/School checks, cash and credit cards (Discover, American Express, MasterCard and Visa). Doorly Dollars are also available and can be purchased at Guest Services and the Lozier Giant Screen Theater®. They are sold in increments of $5 and can be used throughout the entire Zoo. Once inside the Zoo, do you accept credit cards or checks? We accept Visa, MasterCard, Discover, American Express, traveler's checks and cash payments throughout the Zoo. Money orders and check payments can only be used for on-site membership purchases. How much is daily Zoo admission? Please note: The Lozier Theater is now considered a paid feature within the Zoo. Admission to the theater will only be issued to guests visiting with an Omaha's Henry Doorly Zoo and Aquarium membership or with regular paid admission. Guests cannot use admission from a previous day to purchase Lozier Theater tickets. Same-day admission only. Can we purchase day passes online? The Zoo does offer the ability to purchase day passes online. Click here to purchase your day passes. Do you offer a discount for two-day pass? The Zoo does offer a discount on a two-day pass. Must be used consecutively with first day admission. When purchasing Zoo admission tickets online, check the box "Upgrade to Two-Day Admission." Another way to save is to become a member! An annual household membership would allow access to the Zoo for two adults and dependent children (ages 0-20) from one address along with reciprocal privileges to many other zoos across the country. Do we have to pay to re-enter if we leave and return the same day? When departing the Zoo, a hand stamp will be given to each visitor for re-entry. Yes, the Zoo offers discounts for schools paying as a group but there are no discounts for individual students. Contact the Education Department at (402) 738-2092 for more information or click here. Group discounts are offered to parties of 40 or more with a reservation. For more information or to make a reservation click here. The Zoo offers a military discount on daily admission, as well as annual memberships. Click here for more information on military discounts for daily admission. For more information on military discounts for annual memberships, click here. Do you offer a discount for AAA or other clubs? The Zoo does not offer discounts on daily admission for AAA or other clubs. Are there coupons available online or at any stores? The Zoo strives to keep our admission costs low in order for families to visit multiple times. At this time there are no discounts for admission. Is there a discount if we arrive late in the day? The Zoo does not offer pro-rated admission for late entry. Do you offer discounts for home school families? The Zoo does not offer any discounts for home school families. Large groups may contact the Education Department to arrange a possible group discount at (402) 738-2092. For large families, a household membership would be a great value. A household membership admits two adults and up to six dependent children (ages 0-20) from one address. Click here for more information. For more information on daily admission fees, click here. Are there additional costs besides the admission charge? Zoo admission covers entry into all of our main exhibits. The following require an additional charge: train, tram, Skyfari, Sue's Carousel, the Lozier Theater, Stingray Beach, Budgie Encounter, Giraffe Encounter, concessions and gift shop purchases. If I do not use my ride ticket, do I get a refund? Ride Tickets are non-refundable. If guests have a ticket remaining with the exception of the all-day ride pass, it may be used on another visit. The all-day ride pass must be redeemed on the date of purchase. Do you offer an all-day rides pass? The Zoo does offer an all-day rides pass seasonally. This is for unlimited rides on train, tram, Sue's Carousel and Skyfari. The pass is valid one day only. Are there restrictions on rides? All rides are weather dependent and will not operate if there is rain, snow, ice or if the temperature will not reach 50 degrees by 1 p.m. Skyfari will not operate if there are high winds. You must be at least 12 years old to ride Skyfari without an adult. Children under the age of 12 will be required to ride with an adult. You must be at least 42 inches tall to ride Sue's Wildlife Carousel without an adult. Click here for hours of operation, pricing and other information. I lost my card. Can I still come in? How much for a replacement card? Members are asked to present a valid membership card and photo I.D. on each visit. If you misplaced your membership card, please visit Guest Services, located at the main entrance of the Zoo to inquire about recieving a replacement. The individual membership admits the listed cardholders only. Military and household memberships will admit up to six children at the owner's address (ages 0-20). The grandparent membership will admit up to six grandchildren of the two listed cardholders (ages 0-20). To admit an extra adult for each visit, please consider purchasing the plus-one membership add on. Click here for more information. Can I bring my daycare group under my membership? Memberships do not admit daycares. Certified daycares receive school group admission. Click here for more information. Are foster children covered under my membership? Yes. The household and military memberships admit dependent children (ages 0-20) from the owner's address. Click here for more information. If both cardholders are present, can we still bring a guest? The individual-level membership admits the owner only. All other levels of memberships will admit only two adults per visit. To admit an extra adult for each visit, please consider purchasing the plus-one membership add on. Click here for more information. How will I receive my membership card? If you are renewing your membership, once we update your record, your current membership card should be used for admission. For new members, your card will be mailed to your home within two weeks from the date we received your order. Does the Zoo donate to fundraisers and silent auctions? 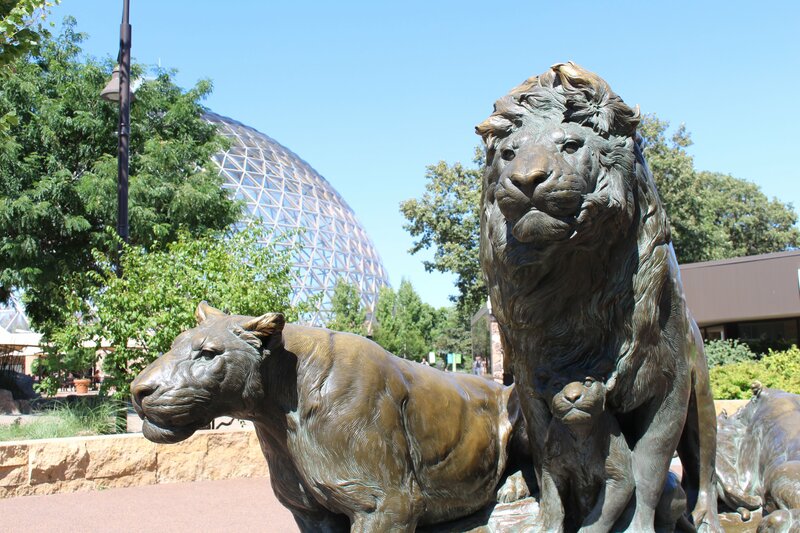 Omaha’s Henry Doorly Zoo and Aquarium, a non-profit organization, prides itself on its contributions to the surrounding communities. In an effort to give back, the Zoo is willing to consider requests from the local community. Click here for more information. Does the Zoo offer special admission passes for qualifying local 501c3 organizations? Special Pass memberships are provided to non-profit agencies meeting certain criteria set by Omaha's Henry Doorly Zoo and Aquarium. Click here for more information. Are professional photo or video shoots allowed on grounds? Omaha's Henry Doorly Zoo and Aquarium has guidelines in place for non-commerical and commerical photography and videography on grounds. Click here for more information. What shows are currently playing? Click here for a list of films and showtimes. The average show played at the Lozier Giant Screen Theater® is 45 minutes. Can we keep the 3D glasses? The 3D glasses must be returned after each film as they are reused. Are the 3D glasses cleaned? The 3D glasses are cleaned/sanitized after each use. Does the combo rate mean both movies? Combo rates are offered for Zoo admission and one film at the Lozier Giant Screen Theater®. Click here for pricing. Can I see a show without visiting the Zoo? The Lozier Giant Screen Theater is now considered a paid feature within the Zoo. Admission to the Lozier Giant Screen Theater will only be issued to guests visiting with an Omaha's Henry Doorly Zoo and Aquarium membership or with regular paid Zoo admission. Guests cannot use admission from a previous day to purchase a tickets to the Lozier Giant Screen Theater. Same-day admission only.